CalDAV is an industry standard for calendar servers. BusyCal can connect to CalDAV servers, using them to sync calendars across your devices and share them with others. BusyCal can use CalDAV to sync calendar data across your devices. BusyCal (for both iOS and Mac) and the built-in Calendar app on iOS and OS X are CalDAV clients that sync with a CalDAV server. This means any data you enter into the built-in Calendar app on iOS or OS X will sync to BusyCal through the server, and vice versa. As long as you have all client apps configured to sync with the same server, all your calendar data remain in sync. Tap the Connect button next to CalDAV. Enter your username and password, and the server address, and tap Add. If you want to sync calendars between an iOS device and a Mac or share calendars with others without having to rely on a cloud syncing service like iCloud or Google, you can host your own CalDAV server on your local area network. BusyCal (for both iOS and Mac) and the built-in Calendar app on iOS and OS X are all client apps that sync with CalDAV servers. This means any data you enter into one client app will sync to all other client apps through the server. As long as you have all client apps configured to sync with the same server, all your calendar data remains in sync. 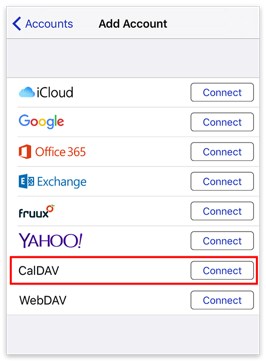 All calendars you want to sync between your iOS devices, Macs, and other users, must be hosted on the CalDAV server. You cannot sync calendars from other sources (iCloud, Google, Exchange, etc.) to the server. Apple’s OS X Server can be used for this purpose and can be purchased from the Mac App Store for $20. OS X Server functions as a CalDAV server much like iCloud except that it’s accessible only on your local area network. Macworld — iTunes iOS syncing gone? Solve it with Server! If OS X Server doesn’t meet your needs, you may want to consider other third-party servers, such as Kerio or Zimbra. Both servers support CalDAV and Exchange EWS protocols and are fully compatible with BusyCal. BusyCal enables you to share calendars with other users who are syncing with the same CalDAV server. Once each user has configured BusyCal to sync with their personal account on the CalDAV server, you can share calendars with each other. When a calendar is shared, events can be edited by any user, and changes sync between them. You can share a calendar through CalDAV with other CalDAV users in your organization, but you must set this up using BusyCal for Mac (or another CalDAV client); you can’t enable sharing in BusyCal for iOS. For details, see Sharing Calendars with Others through CalDAV in the BusyCal for Mac help.